UPDATED: Thu., Jan. 17, 2019, 10:47 p.m.
For a long time in the Northwest Conference – for basically all of Matt Logie’s eight-year tenure at Whitworth – two men’s basketball programs have dominated and monopolized postseason bids. Those programs – Whitworth (13-2, 5-1 NWC) and Whitman (14-1, 6-0) – aren’t showing any signs of losing that grip. Both are ranked inside the top 10 – the Pirates at No. 6, the Blues at No. 4 – in this week’s d3hoops.com poll. Neither has lost to another team in the conference this season, with the Blues defeating the Pirates 100-98 last Tuesday in Spokane. But the rest of the NWC is trying to catch up, and they’re doing so by stepping back and draining a lot more 3s than they did four years ago. That includes Puget Sound (7-8, 3-3), Whitworth’s opponent Friday at 8 p.m. in the first of back-to-back home games at the Fieldhouse. Pacific Lutheran (6-8, 3-3) follows Saturday at 6 p.m.. Both will be preceded by women’s basketball games between the same programs. UPS ranks fifth nationally in 3-point shooting percentage, making 42.5 percent of its attempts from beyond the arc. Five NWC teams rank among the top 33 nationally in 3-point percentage. At the end of the 2014-15 season, among NWC teams only Whitworth, at 21st, ranked within the top 33 in that statistic nationally. All that increased shooting has led, unsurprisingly, to more scoring. This season Pacific (Oregon) is third nationally in points scored (106.0), followed by Whitman in fourth (103.0) and Whitworth in eighth (93.7). Linfield, at 90.4, is 15th, and George Fox, scoring 89.7 points per game, is 17th. Four years ago, Whitman (ninth) was the only NWC team ranked in the top 50. And that means lots more shooting. 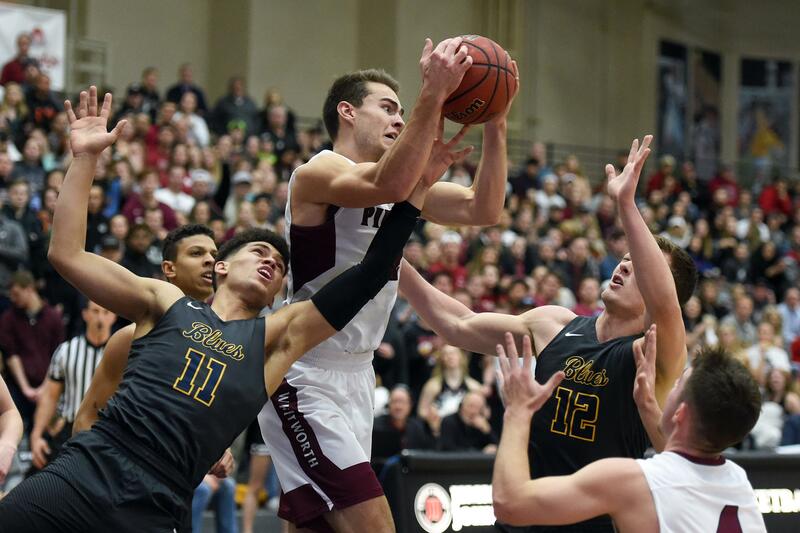 Whitworth and Whitman’s dominance of the NWC has been impressive. They have finished 1-2 in the regular season every year since 2011-12, when Whitworth won the conference and UPS finished second. In the past four seasons, the Pirates and Blues have three combined losses that weren’t to each other. Whitman has been upset in the first round of the four-team conference tournament twice, but still: No other team has reached the Division III Tournament over that span (the most recent was UPS in 2008-09), and never have three NWC teams made the tournament in one year. That puts a lot of pressure on the rest of the conference to unseat its two kingpins. Linfield (12-4, 5-2) nearly beat Whitworth last Saturday, leading much of the second half before the Pirates closed out on a 9-3 run for a 78-75 victory. Nearly halfway through the conference slate, Linfield sits in third place and still has a chance to slide into the top two. It also received votes in the d3hoops.com poll this week. Whitworth has won its past 22 games against UPS and the past 27 against PLU. Since Logie took over as head coach eight years ago, the Pirates have lost 15 regular-season conference games: 11 to Whitman, two to George Fox and one each to Pacific and Lewis & Clark. Published: Jan. 17, 2019, 1:48 p.m. Updated: Jan. 17, 2019, 10:47 p.m.